I just got this great set of LED tealights from Mars. I love these tealights, they are super easy to use and add a lot of style to any occasion. You can simply place these tealights in any area and turn them on to get a very pretty candle light look without any wax, fire, or mess. I love these because they have a flickering effect, so it actually looks like real candle light. I use these in a lot of different projects. I’ve used them for crafting, to decorate, I have even put these inside of carved pumpkins at Halloween or into paper bags at Christmas time. They are very pretty and last a long time. A new feature they have added to this model is that it has a timer on it. So when I use them in my pumpkins I can set the timer, it’s really easy to use and allows you to have them on 6 hours and off 18 hours. This is perfect for those holiday projects where I only want them on at certain times like at night with my pumpkins. It saves the battery and makes them last a lot longer! They come with some decorative rose petals as well which are fun to give an extra touch when using them for decor. Can make a very pretty and romantic scene. NEW TIMER FEATURE TEALIGHTS EXCLUSIVELY BY MARS – This feature makes on/off Tealight flameless candles even simpler. The lights will be lit for 6 hours and then they will automatically turn off for 18 hours and keep repeating this process . With this feature users can just turn the LED tea lights on and leave them at a desired location such as church wedding, yoga and outdoor. These unscented battery powered lights can be use on bathroom and spa to see a little glow coming from these rooms. 12 IN EVERY PACK, SAVE MONEY AND TIME – Every box includes 12 of these flickering romantic battery candles in the Bright White color. This new product by the Marsians Storefront helps users save time and money. These Flameless Tealight Candles with timer come in a very economic rate and last a long time. These are great gifts for him, for her and busy brides. Ideal for Christmas stuffers, Halloween and other special events and party arrangements. FREE FAUX ROSE PETALS – With every purchase of the Timer Flameless Candles by the Marsians Storefront, buyers also get a pack of 100 designer grade faux rose petals for free. 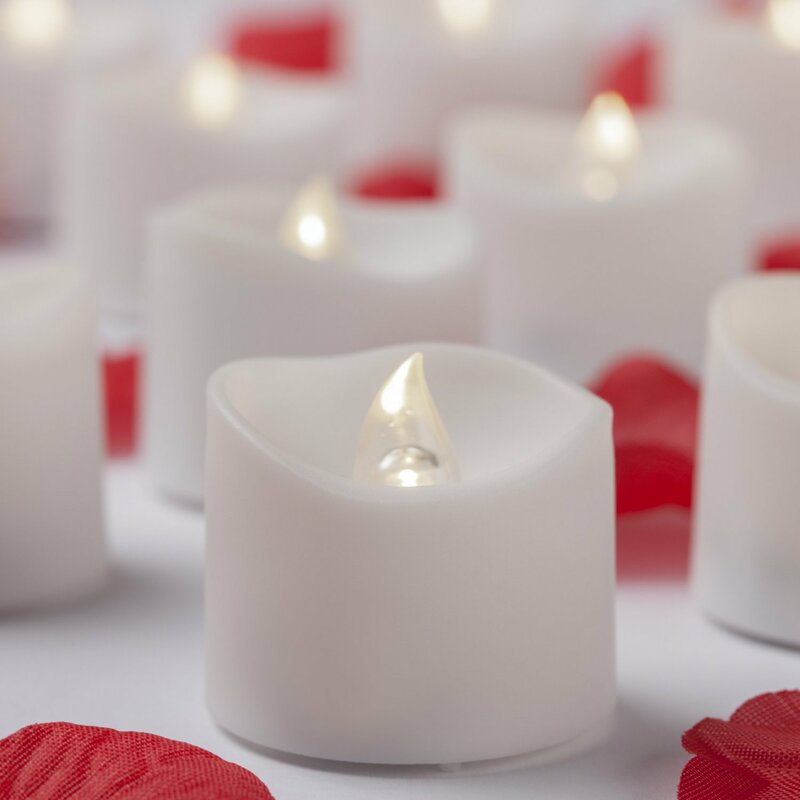 These faux rose petals can be used for decorative purposes and for further boosting the visual charisma of the tealight candles battery operated. Can be used in mason jars and in wine glasses that can be turned upside down with rose petals inside them for absolutely stunning yet cost effective way to decorate. 12 MONTH REPLACEMENT GUARANTEE, NO QUESTIONS ASKED – The Flameless Tealights come with a full one year return policy, only available in Amazon, so if the product stops working due to functionality issue, the Marsians Storefront will replace with another box of tea lights. Available only in Amazon. EVERY LED TEALIGHT COMES WITH A BATTERY – You can save yourself the initial hassle of running out and getting the batteries because the Marsians Storefront ships the Timer Functioned Flameless Tea lights with batteries already fitted. So can turn the Tealight flameless candles on and place them wherever you want right when you receive them. You can find these candles on Amazon! Make sure to check out Mars on Facebook, Twitter, & Pinterest! Great idea to use in pumpkins for Halloween ! !